Get outdoors without risking your sleeping comfort in the Kelty Cosmic 20 Dridown Sleeping Bag. Get into the wilderness to explore and stay the weekend during three seasons this year. Kelty designed the Cosmic 20 Dridown sleeping bag to be used in both warmer temperatures as well as dropping temperatures. 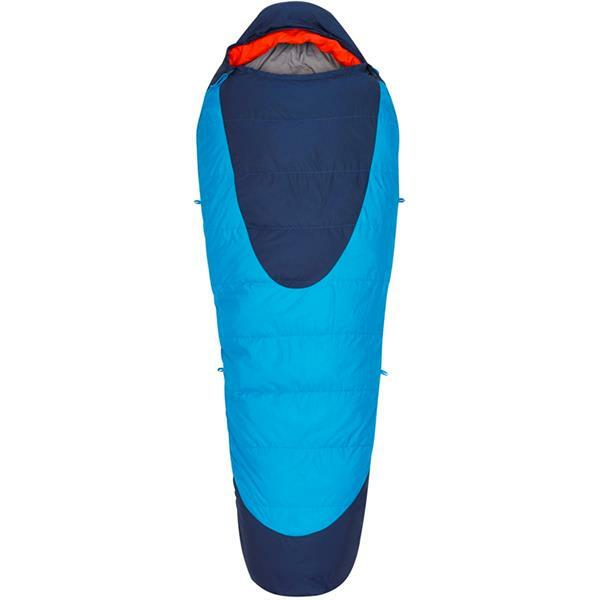 This sleeping bag has a 20�F / -7�C rating and has been designed in the mummy shape. The Cosmic 20 Dridown is insulated with 600 Fill Power DriDown and has a thermal-comfort hood as well as a natural fitting footbox for ultimate sleeping comfort. This sleeping bag features a zipper draft tube that has an anti-snag design and a FatMan and Ribbon drawcord which allows you to adjust the top and lower sections to keep the sleeping bag snug around your face and head during cold weather days. Pack the Kelty Cosmic 20 Dridown Sleeping Bag the next time you go camping and worry about having fun, not staying warm at night. Stuffed Size: 8" x 14"